Studying the world of Brian Eno: scent, strategy, music and environment in experience design and contemplation. Image Copyright, Apple Computer, Inc., © 2008, all rights reserved. Brian Eno — from the Board messages | The Long Now. 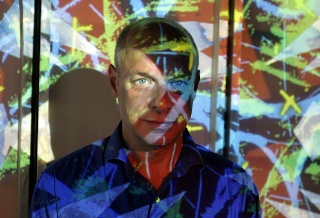 What I’m curious about, actually, is the mind of Eno. And how music, scent, thinking and philosophy seem to come together in the mind-full amalgam of his creativity over the course of the last 60 years. I’d written, some time back (http://blog.girvin.com/nice-one-eno) about the 77 Million Paintings (http://www.longnow.org/77m/) digital piece that Apple had featured on his work. And I’d been wondering about that project: what that means to thinking about creating a digitally populated, self-generating field for art. But there’s a lot to Eno that’s about virally infected ideas — things that start with some little sampled bit, then rove to infections of larger vectors, creating whole new ways of thinking. And listening. And sensing. 77 Million does that — there are an opening group of “odes”, these “songs” translate out to millions of interpretations. I suppose that the opening epiphany for me was really about the concept of ambient music, which was, back then, the 70s, such a wildly quirky (yet cool) gesture to sound-in-space. Music for Airports, ambient creation one — www.youtube.com/watch?v=RQ3b_s0f7lg — was such a surprising opening — even the title was ambigious. I mean, really, who listens to sound in airports? Even today, music in airports is not ambient-based — it’s a long sprinkling of ridiculous Homelandian messages — enough, I’d surmise, to drive an airport worker “postal”. There are few ambient “tinctures” that are attractive — with exception to the sound implications of the long, subsurface corridor beneath the various United terminals at O’Hare. LaGuardia, in the late 80s, actually used Eno’s Music for Airports, for a brief stint. But what I find intriguing is the idea of experience | and experiment | in sound — to be a curious balance in the mind of Eno, that is, as well, about his fascination with scent. Of course, I can relate. The scent space that I live in is vetiver-based — very dirty, smoke, leather, woods — so the opening allegory to that foundation speaks to my heart. But the idea of creating scent maps is the contrary position to Eno’s curiosity about randomness and generative music — what I mean is that he is, on the one hand, fascinated by the concepts of music that are “self looping,” virally induced or based on algorithmic expansions — but on the other hand, he tries to quantify it, somehow. 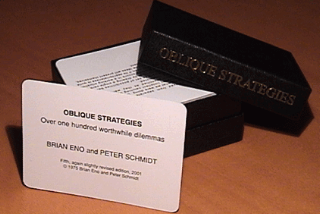 His Oblique Strategies, a series of cards that are designed to create answers to questions, or questions that answer, is an interesting counterbalance to both of these opposites. John Alderman: “They’ve started putting it in the water, you know. Why will the future be like perfume? John Alderman: Do you have a favorite perfume? Brian Eno: No, there’s nothing new that I particularly like. I like Guerlain…. I mix my own, you know, and then throw them away. I’ve made a very good sexual perfume, actually. John Alderman: Did you have a title for it? What’s it like? Hmm… In connecting personally, and live, with Brian, either in the early 80s in Vancouver, or later in Seattle, I never linked to his scent explorations — at least directly by smell. Actually, when I met him, I didn’t know of his interests. But he’s that — in direct experience: vague, yet genial — which is kind of how I’d experienced him in those encounters, that is, friendly, quiet, and vague. Or smoky. Like perfume. And in a manner, this is part of the character of his music (some of it, to be sure): it drifts around you like filmy incense, wandering around your mind, persistently uncovering recollection and tangential content — the archaeology of memories, associating and re-minding. “Long-time followers of Fripp and Eno will notice artifacts typical of each artist’s work from the represented eras: the looped space-jazz dub of Eno’s Nerve Net and The Drop; the fuzzed-out ostinatos of solo guitar Frippertronics; bass and drum with swirling improv redolent of Fripp’s various King Crimson spin-off Projects. Eno works his usual magic with effects and textures: filters, delays, metallically resonant and constantly morphing synth tones. I find the descriptions of music, between scent and the sequencing of the “acquisition of notesn” and the melodic phrasing to how we hear, to be an added deepening of the connection between the idea of experience in fragrance (like Eno’s Neroli — both scent and story — attached to, and built around, music) and the sensing of sound. “The pieces, disparate in mood and texture as they might be, are sequenced artfully.In its variously tinted and constant flow of juxtapositions, the overall effect of Beyond Even is satisfyingly similar to that of Eno’s classic Music For Films releases,” Kevin Macneil Brown notes from the Dusted Magazine article (above). Sounds like smell, to me. And there is inspiration in scenting — Eno, intriguingly, finds his “hits” in the air: “Eno, musical scientist, in which he is circling the notion that he sniffs out new music. He goes on: “He thinks of a neglected part of his art and design work from over the years. “Well, there’s the perfume. I put a lot of time into perfume, and nothing really came of that apart from the lecture.” The lecture he gave about perfume eight years ago, which also involved a talk about David Bowie‘s wedding, and other things, was his last “live” performance, if you don’t count installation works in museums around the world and bike rides around his neighbourhood. I mention that I’m surprised that there isn’t an Eno perfume available at airport duty-free shops, called “Discreet”, or “Perfume For Wearing”. “A knowing, known and unknown smell that’s as pleasant as you want, and light and dark, and nothing else. Enophiles will recognise it if they’re familiar with the odour of Evening Star, the ardour of Before And After Science, the colour of My Life In The Bush Of Ghosts, the dissolved edge of Low, and the pallor of The Drop. Of course, what does that mean? It’s all about smoke and dissolution — scented one moment, dissolved in vapor, another instant. And, this is — in a way — what it is about: the momentary experience, what is sensed, then recalled — and the evanescence of that encounter. Scent, like music, fades, the beauty of the instant can dissipate — but can be, as well — unforgettable. The opening notes of “Music for Airports“, or the initial scent note phrasing of Guerlain’s Vetiver — I’ll not forget them. A Beautiful D I S A S T E R | NYC! Firenze | What Site, Sighted?